Conservatives say marriage is the “ultimate anti-poverty program,” and claim that most of our economic woes would vanish if more people got hitched. A new study suggests marriage barely makes a dent in poverty. Rubio and Ryan are two sides of the same counterfeit coin on poverty. One is “a classic exercise of confusing correlation with causation,” that generalizes a relationship between marriage and poverty from a single statistic. The other uses that generalization to moralize about “culture” and “character,” and blame the poor for their condition. 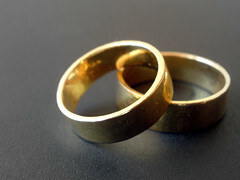 A new analysis, by Kimberly Howard and Richard V. Reeves at the Center on Children and Families at the Brookings Institution, suggests that conservatives are wrong about how much marriage actually impacts poverty. Howard and Reeves peer far deeper into the “marriage gap” than Rubio or Ryan, and come up with much more thoughtful answers. Starting with data showing that children raised by married parents tend to do better all around, Howard and Reeves ask further questions where conservatives rely on magical thinking. Why children of married parents are more successful is complicated, but Howard and Reeves find that the benefits come from two principal sources. Howard and Reeves note that people with bachelor’s degrees are more likely to get married and stay married — and tend to earn more — than those with less education. How important is income? Assuming that both parents work, marriage means more household income. Thus, conservatives conclude, marriage makes poverty less likely. Children who grow up with married parents rank about 14 percent higher on income distribution as adults than those who don’t. Howard and Reeves controlled for family income throughout childhood and discovered that taking income out of the equation shrinks that “marriage gap” from 14 to 9 percent. Factoring in “parenting behavior, maternal education, race, and maternal age,” shrinks the gap even further — to just 4.5 percent. The parent effect is harder to measure. Howard and Reeves note that the same traits and characteristics that support marriage are likely to support the “emotional support and cognitive stimulation” children receive from their parents. Thus, people who commit to each other in marriage are more likely to be committed to raising their children. When parenting behavior is factored in, the “marriage gap” shrinks from 14 percent to 7.5 percent. The parent effect is also probably an extension of the income effect. Not only do educated parents earn more, but they’re likely to have more time to be engaged with their children. They’re more likely than less educated, lower-income parents to have jobs with regular hours and weekends off. Marriage licenses and wedding bands are not a magic “cure” for poverty. As I wrote earlier, conservatives like Paul Ryan and Marco Rubio get it backwards on families and poverty. It’s poverty that causes the “breakdown” of many families, not the other way around. Those are good places to start, and a number of policy proposals can help us get there. Livable Wages. More than seven million American children have parents who earn minimum wage. Increasing the minimum wage would further narrow the income gap. Equal Pay. In four out of ten households, the primary breadwinner is a woman. Paycheck fairness would further narrow the income gap. Subsidized Childcare. Assisting parents with childcare costs would make it easier for parents to work, and fewer low-income parents would go to jail for being too poor to afford childcare. Paid Sick Leave. About forty million workers lack paid sick leave. Guaranteeing paid sick leave would increase both family engagement and productivity — because sick workers who stay at home don’t infect their co-workers. Paid Family Leave. No American workers are guaranteed paid maternal or paternal leave. Guaranteeing parents paid leave to care for and bond with their new additions promotes engaged parenting. Marriage itself doesn’t do much to reduce poverty, Creating a family friendly economy can do that, plus a lot more.